Looks yummy. I’ll have to try these. It’s so hard to come up with gluten-free breakfast ideas! And they’re easy to do too! They can be a bit time-consuming so make a batch and keep some in the freezer, they cook well from frozen. Hi Monica, lovely photos of Ireland on your site. Glad you enjoyed it there! And thanks for the B&B tip, it looks great and Galway is definitely due a visit – you’re right that it’s a great place for food (even veggie food), and excellent coffee! 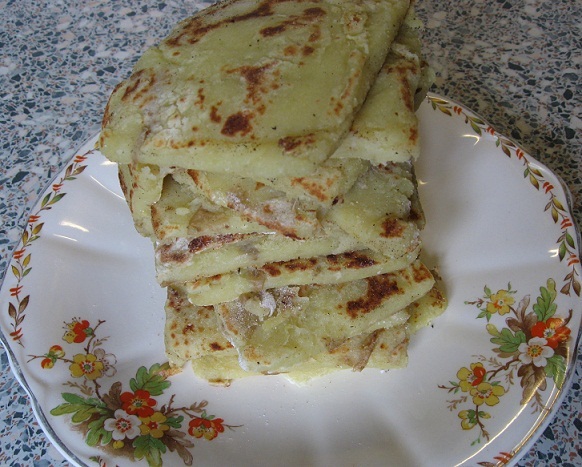 And I’m going to seek out a recipe for those polish pancakes, they sound delish! Would the texture be terrible if you didn’t use gluten free flour? Hi Jen, it’s always nice to reminded of memories by food! 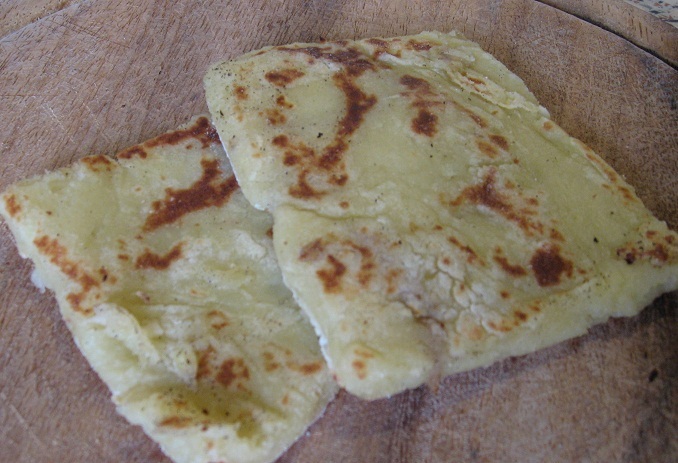 Potato farls work fine with wheatflour. I added the apple in this recipe because gluten free flour can be a bit dry, but I should think it would liven up regular flour too! These are scrummy! I used to love potato cakes but they usually have wheat flour in them so i’ve left them off my menu for a while. These are just as good and so cheap to make! Next time I might make half the amount thoughas it took me ages to cook them all – also they took ages on my slow gas cooker. But worth it all the same..I am looking forward to having them for breakfast at work with a little goats cheese, and maybe sometimes with cream cheese and a little faux caviare! Hi Ciara, I can really picture you jumping for joy – thanks for the lovely comment! I usually pop frozen farls under the grill for a few minutes each side. They actually hold together pretty well in the toaster so that works too. I haven’t tested them in a microwave, but I should think it would work fine, just be careful not to dry them out too much.